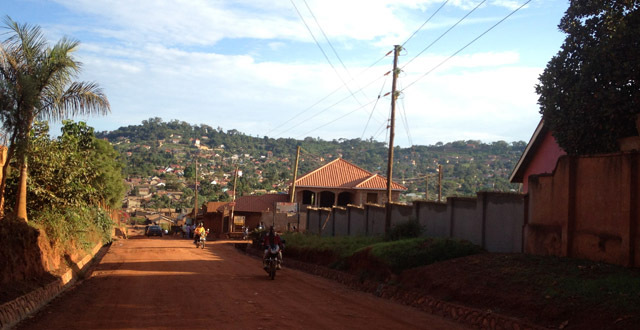 Nsambya is mostly a residential area with a diverse range of housing and infrastructure. The valleys are overflowing with small, very crowded neighbourhoods and bumpy dirt roads. As you climb the hill, the houses fluctuate from mid-range to more expensive. A few rare sections of paved roads at the top of the hill provide the nicest accommodations with beautiful views of the lush, surrounding hills. The view, although simple, never gets old. This area isn’t known as one of the most secure neighbourhoods in Kampala, but I have never had a problem. There isn’t a lot to do in residential Nsambya but it’s close to lots of conveniences. The US Embassy and Joint Medical Store are the two major landmarks in Nsambya. If you need to purchase any kind of basic medical supplies, you can order them at Joint Medical Store. When navigating through Nsambya be aware that it might have the highest concentration of speed bumps in all of Kampala. Especially when traveling by boda-boda (motorcycle taxi), prepare for a lot of bumpy stop and go! If you’re on a tight budget, lots of searching in Nsambya can turn up a nice residence that will be much cheaper than the surrounding areas. Decent accommodation is rumoured to be as low as $250/month. A pretty nice home often goes for $500/month unfurnished. Find a local broker that is plugged into the local network of real estate brokers if you are looking for a place. For an apartment, try Nsambya Apartments for secure, fully furnished three bedroom apartments at $350 per week. Le Petit Village Hotel – Thatched roof, “safari-chic” hotel with rooms ranging form standard to executive. There is a pool on the grounds and all rooms have WiFi and some have private terraces. With restaurant, cafe, butchery and veggie-shop on the grounds, you’ll have every convenience at your finger tips! Rates range from $150-$200 per night. Most of the shopping and dining in Nsambya can be found on Quality Hill, which might technically belong to adjacent Kabalagala but is certainly just on the border and very accessible to Nsambya residents. Quality Hill is a small, Belgian-owned compound with a butchery, cafe, restaurant, small veggie shop and a hotel. Quality Cuts – A small, high-end butchery that offers luxury cheeses, quality meats, cold cuts, delicious $4 sandwiches and ice cream! Joint Medical Store – The largest supplier of medical supplies in Uganda, it’s intended mostly for commercial customers but will cater to individuals, who order ahead of time, as well. Mazima Mall (Uchumi) – A new shopping mall with Uchumi Supermarket as the anchor tenant. The supermarket which carries a wide variety of food, supplies and imported treats. There is also a small food court adjacent to this Uchumi branch with fast food, pizza, and exceptionally delicious ice cream. If you need to grab something in a hurry Uchumi is probably the most convenient place to do so. Shops throughout the mall are small and are opening slowly by slowly. Embassy Supermarket – Just down the road form Uchumi, this supermarket has similar products and prices but a less commercial feel and a few more imported goods. Gaba Road: Sells all kinds of hand made furniture if you need to furnish your place! Beds, tables, chairs etc. Bypass Road: (The road that connects Mukwano roundabout to the Gaba Road stoplights) Has a wide variety of house plants and flowers which they will pot for you if you request it. The word “limited” best describes Nsambya’s recreational options. Take a drive to Munyonyo for a fun weekend outing with the family! Le Chateau – Located at Quality Hill, this Belgian owned French restaurant is somewhat pricey but the food is great. A great ambiance, quiet and candle-lit. Most upscale restaurants are located closer to the city, and Le Chateau offers a convenient alternative for those who live on this side of town. La Patisserie – An adorable little cafe and bakery. Every pastry here is delicious, probably the best in the city. You can also order various cakes ahead of time for special occasions. They also carry cute, organic, locally made spiced jams that make great gifts. No wifi, though. The nearest nightlife is in Kabalagala, which isn’t technically Nsambya but borders it. Kabalagala is a hotspot for rowdy entertainment, it’s the center for Ugandan bars and nightlife that don’t cater to ex-pats and there’s good street food available all night. Rolexes, named after the “rolex” watches sold on the same corners, are my greasy food of choice. They consist of eggs scrambled with tomatoes and onions, wrapped in flat bread that is fried on an open stove. Some friends recently set out to prove that Kabalagala never sleeps and successfully spent 24 raucous hours exploring the area! There are also a few good, low-cost places to eat in Kabalagala such as Ethiopian Village Restaurant. DePosh – A good place to lounge on the patio under glowing, tangled Christmas lights hanging in the trees and sometimes to catch live jazz. Nsambya Hospital – A Catholic, not-for-profit hospital. Do you have the contact for “Nsambya Apartments”? How can I find them?